If my informal polling of friends and coworkers is any indication, the odds are good that you either have no backup system for your computer or your backup system is woefully inadequate. Remember that “data” doesn’t just mean spreadsheets, databases, PowerPoint presentations, and word processor documents; I’m also talking about your vacation pictures, your music library, and anything else you might have stored on your computer. You probably don’t want to lose this material. I’d like to help you fix the situation. I’m going to tell you about three different ways of getting your data off-site for safekeeping. I’m a little embarrassed to confess that I use all three of these strategies because I don’t like the idea of relying on just one system or company to safeguard my data. Don’t wait until your hard drive crashes and then go scrambling to try to get it to work again just long enough to save your data on another drive, because this almost never works. Once a hard drive dies, it almost always remains steadfastly deceased, bereft of life and resting in peace, no matter how many times you whack it with a rubber hammer or stick it in the freezer. Both of these are strategies I’ve heard people recommend to try to revive failed hard drives. While there are companies that specialize in recovering data from bad drives by dismantling them in clean-room environments, then reading the data off of the raw platters, they are scary-expensive. I’ve seen estimates in the hundreds of dollars, and they’re not guaranteed to retrieve everything, depending on exactly how the drive failed. For example, if the heads crashed into the platters, no one is going to be able to restore data from scratched discs. I do computer work for a living and I cannot count how many times I’ve heard stories about people losing years of valuable data or creative work because they never took the time to backup. Some of these tales are heartbreaking, like the grad student who kept her dissertation on a single USB thumb drive, no copies, no backups, not even printed paper, and then one day the drive just died — as these things are wont to do sometimes — and she had to start over from square one. If you’re like a lot of people I’ve talked to, you may have an external USB hard drive at home. Every once in a while, you hook it up and copy your documents or photos to it. When you’re done, you stick the drive in a drawer and there it sits until it occurs to you to do it again. That’s not a bad start and it’s certainly convenient, but it’s woefully inadequate. Let’s suppose that’s the system you use. Let me ask you what happens if your house burns down? That’s right — you’re out of luck. You really need an off-site backup system. In addition, I firmly believe that the ideal is to have multiple redundant off-site backups. Here are three systems I’d like you to consider. This is the most basic, stone-simple way of doing off-site backups. Buy two USB hard drives and copy all your data to both drives. Store one in your safe deposit box. Alternatively, if you don’t have a safe deposit box — and I recommend you get one for all kind of reasons not having to do with data backup — give it to a trusted friend to keep at their house or store it at work. (A downside of this method is that if you don’t encrypt your data and your friends or coworkers are nosy, you run the risk of someone snooping into your personal info.) Every month or so, backup to the drive at home and exchange it with the off-site one. This method requires a bit of effort and your off-site backups are never current, but it’s better than nothing. Also, if there’s some wide-area disaster, like a flood or tornado destroys your house and your friend’s house while also razing your bank, your data is gone. Sorry. Google, Microsoft, and Box.com among others offer free or low-cost online storage via their cloud services. Bear in mind that this is not a true backup system, but it does get your info out of the house and stored somewhere reasonably trustworthy. 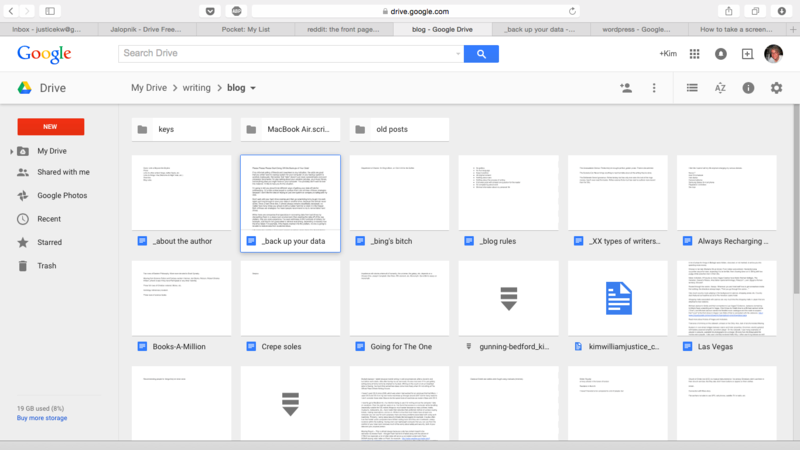 I like Google Drive and make extensive use of its features. 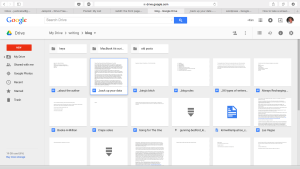 In fact, this article was written in Google Drive’s word processor before I transferred it to WordPress on my website. Google’s file sync program constantly runs in the background on my computers, and when I save a file to my Google Drive file structure, the synchronizer automatically copies the new material to Google’s servers. Also, if you use multiple computers as I do, the sync software will make sure that every one of your machines has the most current versions of your files. Now, if your house burns down, you can log into your Google account and access your files with no worries other than having to deal with a burned-down house. Sorry about that. While this may sound similar to the cloud storage option, it is a little different in that it is a real backup system with versioning, delta backups, etc. Services like Carbonite and CrashPlan charge a monthly or yearly fee to back up your computer to their servers, so if your computer’s hard drive fails, you can restore to another machine or to your repaired machine when you get it back from the shop. Their software runs in the background and backs up every half-hour or so. You never have to think about backups because they run all the time. Rather than just synchronizing a specific set of folders on your computer, these companies can be configured to backup the entirety of your user space. I use CrashPlan and have been happy with their service and their product. Again, if disaster strikes, your data is stored safely in a far-away place and you can retrieve it anytime. How do you handle backups? Do you have a system in place? Does your backup routine include and off-site piece? Let me know in the comments! ← I Are Movie Illiterate. But I’m Doing Something About It!